This article is about the hypothetical class of particles. In astrophysics, weakly interacting massive particles, or WIMPs, are hypothetical particles serving as one possible solution to the dark matter problem. They are considered one of the main candidates for "cold dark matter." These particles interact through the weak nuclear force and gravity, and possibly through other interactions no stronger than the weak force. Because they do not interact with electromagnetism, they cannot be seen directly, and because they do not interact through the strong nuclear force, they do not react strongly with atomic nuclei. This combination of properties gives WIMPs many of the properties of neutrinos, save for being far more massive and therefore slower. They interact only through the weak nuclear force and gravity, or at least with interaction cross-sections no higher than the weak scale. Because of their lack of interaction with normal matter, they would be dark and invisible through normal electromagnetic observations. Because of their large mass, they would be relatively slow moving and therefore cold. As a result they would tend to remain clumpy. Simulations of a universe full of cold dark matter produce galaxy distributions that are roughly similar to that which is observed. WIMPs are considered one of the main candidates for "cold dark matter," the other being massive astrophysical compact halo objects (MACHOs). (These names were deliberately chosen for contrast, with MACHOs named later than WIMPs). Also, in contrast to MACHOs, there are no known particles within the Standard Model of particle physics that have all the properties of WIMPs. The particles that have little interaction with normal matter, such as neutrinos, are all very light, and hence would be fast moving or hot. Hot dark matter would smear out the large scale structure of galaxies and thus is not considered a viable cosmological model. WIMP-like particles are predicted by R-parity-conserving supersymmetry, a popular type of extension to the Standard Model, although none of the large number of new particles in supersymmetry has been observed. Because WIMPs may interact only through gravitational and weak forces, they are extremely difficult to detect. However, many experiments are currently underway to attempt to detect WIMPs both directly and indirectly. Although predicted scattering rates for WIMPs from nuclei are significant for large detector target masses, it has been predicted that halo WIMPs may, as they pass through the Sun, interact with solar protons and helium nuclei. Such an interaction would cause a WIMP to lose energy and become "captured" by the Sun. As more and more WIMPs are thermalized inside the Sun, they begin to annihilate each other, forming a variety of particles including high-energy neutrinos. These neutrinos may then travel to the Earth to be detected in one of the many neutrino telescopes, such as the Super-Kamiokande detector in Japan. The number of neutrino events detected per day at these detectors depends upon the properties of the WIMP, as well as on the mass of the Higgs boson. Similar experiments are underway to detect neutrinos from WIMP annihilations within the Earth and from within the galactic center. It is important to note that, while most WIMP models indicate that a large enough number of WIMPs would be captured in large celestial bodies for these experiments to succeed, it remains possible that these models are either incorrect or explain only part of the dark matter phenomenon. Thus, even with the multiple experiments dedicated to providing indirect evidence for the existence of "cold dark matter," direct detection measurements are also necessary to solidify the theory of WIMPs. Although most WIMPs encountering the Sun or the Earth are expected to pass through without any effect, it is hoped that a large number of dark matter WIMPs crossing a sufficiently large detector will interact often enough to be seen—at least a few events per year. The general strategy of current attempts to detect WIMPs is to find very sensitive systems that can be scaled up to large volumes. This follows the lessons learned from the history of the discovery and (by now) routine detection of the neutrino. CDMS parameter space excluded as of 2004. DAMA result is located in green area and is disallowed. A technique used by the Cryogenic Dark Matter Search (CDMS) detector at the Soudan Mine relies on multiple very cold germanium and silicon crystals. The crystals (each about the size of a hockey puck) are cooled to about 50 millikelvins. A layer of metal (aluminium and tungsten) at the surfaces is used to detect a WIMP passing through the crystal. This design hopes to detect vibrations in the crystal matrix generated by an atom being "kicked" by a WIMP. The tungsten metal sensors are held at the critical temperature so they are in the superconducting state. Large crystal vibrations will generate heat in the metal and are detectable because of a change in resistance. The Directional Recoil Identification From Tracks (DRIFT) collaboration is attempting to utilize the predicted directionality of the WIMP signal in order to prove the existence of WIMPs. DRIFT detectors use a 1m3 volume of low pressure carbon disulfide gas as a target material. The use of a low-pressure gas means that a WIMP colliding with an atom in the target will cause it to recoil by several millimeters, leaving a track of charged particles in the gas. This charged track is drifted to an MWPC readout plane that allows it to be reconstructed in three dimensions, which can then be used to determine the direction that the WIMP came from. Another way of detecting atoms "knocked about" by a WIMP is to use scintillating material, so that light pulses are generated by the moving atom. The DEAP experiment plans to instrument a very large target mass of liquid argon for a sensitive WIMP search at SNOLAB. Another example of this technique is the DAMA/NaI detector in Italy. It uses multiple materials to identify false signals from other light-creating processes. This experiment observed an annual change in the rate of signals in the detector. This annual modulation is one of the predicted signatures of a WIMP signal, and on this basis the DAMA collaboration has claimed a positive detection. Other groups, however, have not confirmed this result. The CDMS and EDELWEISS experiments would be expected to observe a significant number of WIMP-nucleus scatters if the DAMA signal were in fact caused by WIMPs. Since the other experiments do not see these events, the interpretation of the DAMA result as a WIMP detection can be excluded for most WIMP models. It is possible to devise models that reconcile a positive DAMA result with the other negative results, but as the sensitivity of other experiments improves, this becomes more difficult. 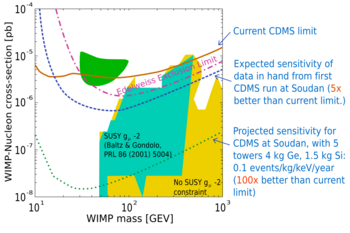 The CDMS data, taken in the Soudan Mine and made public in May 2004, exclude the entire DAMA signal region, given certain standard assumptions about the properties of the WIMPs and the dark matter halo. ↑ Ferrer, F., L. Krauss, and S. Profumo. 2006. Indirect detection of light neutralino dark matter in the NMSSM. Phys.Rev. D74:115007. Retrieved January 15, 2009. ↑ Freese, K. 1986. Can Scalar Neutrinos Or Massive Dirac Neutrinos Be the Missing Mass?. Phys.Lett. B167:295. Retrieved January 15, 2009. ↑ Carr, J., G. Lamanna, and J. Lavalle. 2006. Indirect detection of dark matter. Rep. Prog. Phys. 69:2475-2512. ↑ Fornengo, N. 2008. Status and perspectives of indirect and direct dark matter searches. 36th COSPAR Scientific Assembly, Beijing, China, 16-23 July 2006. Adv. Space Res. 41:2010-2018. Retrieved January 15, 2009. ↑ Drukier, A., K. Freese, and D. Spergel. 1986. Detecting Cold Dark Matter Candidates. Phys.Rev. D33:3495-3508. ↑ Freese, K., J. Frieman, and A. Gould. 1988. Signal Modulation in Cold Dark Matter Detection. Phys. Rev. D37:3388. Retrieved January 15, 2009. Eidelman, S., et al. (Particle Data Group). 2004. WIMPs and Other Particle Searches. Phys. Lett. B 592:1. Sumner, Timothy J. 2002. Experimental Searches for Dark Matter. Living Reviews in Relativity. CRESST - An Experiment Searching for Dark Matter. History of "Weakly interacting massive particles"
This page was last modified on 10 August 2013, at 16:04.